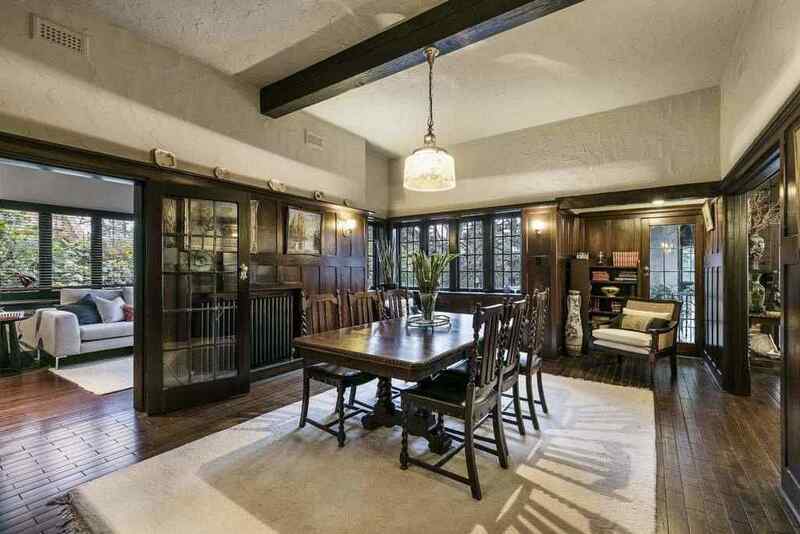 This incredible 1927 (Arts and Crafts) home in Eaglemont is so spectacularly wonderful, so deeply charismatic, it threatens to defy description. If you feel a little like you’ve landed in the Hollywood Hills circa 1920 as you ascend beyond the porte cochere and into the foyer, you’re not hallucinating. It might be the Heidelberg/Eaglemont Hills but it’s mesmerising. The brilliant timber-lined entry foyer, like many of the formal spaces of the house, showcases the soberly beautiful depth of English oak. To the left is a fine study where you can get a good look at the superb, and unusual leadlights, another stand-out feature found throughout. The slightly asymmetrical metal bands and the occasional placement of a bottle-end coloured pane among the glass create a splendid picture. A tiled bathroom sits just before the grand oak stair to the left, but let’s dive into the grandeur of the formal rooms to the eastern side first. The sublime living room boasts the glorious heft of Oregon beams; the walls feature Tudor-esque timber banding and a superb fireplace, with its adjacent divine timber window seat, complete a stunning room. Beyond, the breathtaking dining room is a timber-panelled beauty; the built-in English oak carved sideboard is just another gem in a house jammed full of them. A lovely family room with fabulous windows and views precedes the brilliant modern kitchen with handsome timber cabinetry, marble benches and a fine configuration. In front is a meals area and off here, the large laundry and butler’s pantry. Winding back around, you find a sweet playroom tucked in off a passage leading back to the main hallway. Take the stairs down from either the passage or the spiral stair that sits outside the formal living room to the incredible downstairs space that accommodates its own gorgeous subterranean living room, full stylish kitchen, bathroom and sauna. On the top level, up that magnificent stair, there are four lovely bedrooms and a super cool central bathroom that comes with a massive, fully tiled shower with bell jar ceiling. The beautiful main bedroom has views over the treetops and pool. It includes a strikingly handsome walk-in wardrobe and a chic marble trim en suite. Venture outside to the lovely grounds and you will find a garage and workshop and surrounding the house, gardens boasting a wide array of mature trees from alder and ash to magnolia and maple. 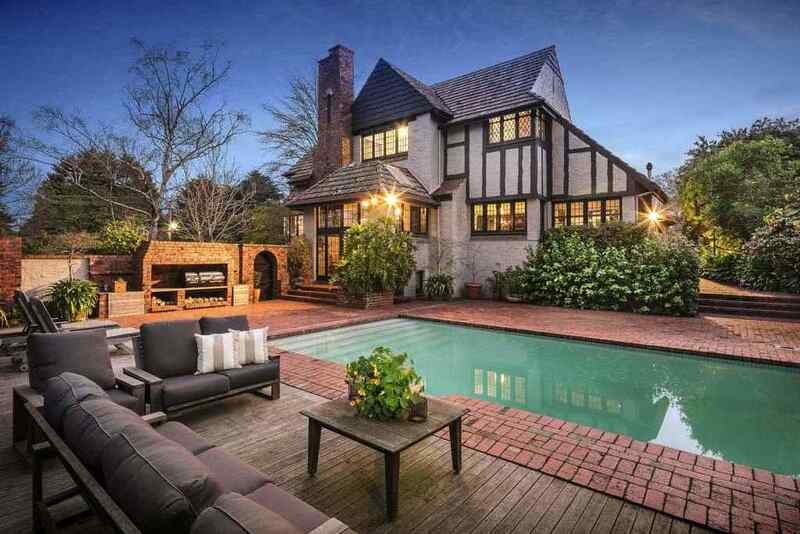 The paved and decked pool surrounds would be a fine place to while away summer, or any old time at all. Room for improvement: There is plenty of space for a cabana near the pool or even a decadent outdoor kitchen. Need to know: Last traded for $70,000 in 1970.